Three different colored pieces of rope are shown and openly tied together. Amazingly, the knots melt away, transforming the pieces into one long three-colored Rainbow Rope! You finish clean and everything can be thoroughly examined! 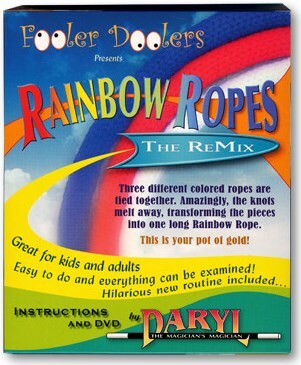 Also included on the DVD is Daryl's personal favorite routine where the ropes are counted one at a time and then tied together with two very special knots. The magician blows on the first knot, but it is the SECOND KNOT that drops off the rope! The magician then blows on the rope where the second knot used to be and the FIRST KNOT drops off! It's an amazing (and hilarious) thing to see! Rainbow Ropes - The Remix comes complete with an expertly manufactured set of ropes (longer, thicker and better quality than any others on the market), detailed written instructions and a performance/explanation DVD featuring numerous effect and handling variations.